It's Thyme to Celebrate a new, healthy market! Fresh Thyme is coming to Mount Prospect, with many other stores popping up in the area throughout the year. Here at ChiIL Mama we're all about green living, eco-friendly choices, and eating healthy food, so we're more than happy to welcome Fresh Thyme to the area! We're also super stoked to see Super Stolie and Miss Jamie from the Farm, Kindie Musician friends of ours, will be there to rock your socks off, with family friendly kids' tunes. They frequently play Beat Kitchen's Concerts for Kids, a rockin' weekly kids' series where ChiIL Mama's the press sponsor. Disclosure: ChiIL Mama is elated to partner up with Fresh Thyme and thank them for providing a gift card for our giveaway. We have been paid to share the grand opening info with our readers. As always, all opinions are our own. 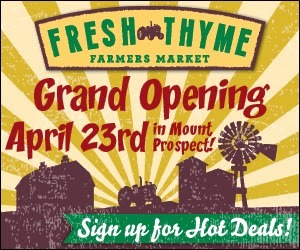 Fresh Thyme Farmers Market, a new specialty grocer featuring healthy and organic value-priced offerings, is excited to announce the grand opening for the first location in Mount Prospect on Wed. April 23, 2014 at 7 a.m. CST. The Mount Prospect Chamber of Commerce, Mayor Arlene Juracek and other village officials will be present for the ribbon cutting at the 211 W. Rand Road store location. It’s time to raise some RUCKUS that Fresh Thyme has finally arrived in Mount Prospect, IL! We think people are going to love this new store and what it has to offer. Fresh Thyme Farmers Market is thrilled to announce the first store grand opening in Mount Prospect, Ill., at 211 W. Rand Road. Doors open on Wednesday, April 23, at 7 a.m. CST. Fresh Thyme CEO, Chris Sherrell, will join the Mayor of Mount Prospect, Arlene Juracek, and the Mount Prospect Chamber of Commerce who will assist in the grand opening ribbon cutting ceremony and officially welcome the new market to the community. Super Stolie helps celebrate Grand Opening! The first 250 guests on Grand Opening Day will receive a limited edition, custom-designed Fresh Thyme reusable bag, created specifically for the Mount Prospect opening. The limited edition bag will be filled with over $50 worth of healthy, delicious groceries! Guests are encouraged to arrive early to reserve their spot in line; limit one bag per household. Additionally, Fresh Thyme will celebrate Earth Day by giving free reusable grocery bags to the first 5,000 guests. In paying tribute to the ongoing community-wide celebration of 100 years of baseball history for the city, guests who wear their favorite team memorabilia on grand opening day will also be given a free color-designed reusable bag. 7 a.m. – Doors Open ~ Thyme to Shop! *The first 250 guests in line receive grocery giveaway bag valued at over $50 of food items! HELP LOCALLY: As part of their commitment to the community, Fresh Thyme will make a financial donation to three different local charities. These charities have shown continual support to the Mount Prospect community, and Fresh Thyme would like to recognize and applaud their efforts and plan to be part of their continued good works in Mt. Prospect and the surrounding area. The local charities include: CEDA Northwest, Mount Prospect Lions Club and the Mount Prospect Parks Foundation. For more information, please visit freshthyme.com. At Fresh Thyme Farmers Markets we believe you shouldn’t have to give away the farm to feed your body nutritious food. We’re on a mission to improve the way our communities eat by offering fresh and healthy food at amazing values -all in a vibrant and fun shopping environment, with smiling friendly faces. The foundation of healthy eating is often based on incorporating more fresh fruits and vegetables in our diets. Therefore, at the core of our offerings is an abundant produce department, overflowing with fruits and vegetables, fresh from the farm, often locally grown and much of it organic. We’re so passionate about produce that we’ve made it the nucleus of the store, ensuring the bounty of fruits and vegetables is visible from all other departments. Fresh Thyme Farmers Market is a new full-service specialty retailer focusing on fresh, healthy, natural and organic offerings, all at amazing values. The stores’ signature offering is an extensive produce department with organic and local fruits and vegetables. In addition, Fresh Thyme’s full-service offerings include a natural meat department, healthy deli foods to go, bakery goods, 400 bulk food bins, natural and organic groceries, dairy and frozen, as well as vitamins and body care products. Fresh Thyme will offer a NEW shopping experience to the Midwest, starting with the first store in Mount Prospect, Ill., opening April 23, 2014, followed by 59 additional stores by 2019. You can learn more by visiting freshthyme.com, and be sure to keep in touch by liking us on Facebook and following us on Twitter. Fresh Thyme is currently hiring a total of 100 local employees for this location. There are numerous full and part-time employment opportunities available in the Meat and Produce Departments such as meat cutter and produce clerk. Anyone interested may apply onsite at 211 W. Rand Road or by sending their resumes to MountProspectJobs@FreshThyme.com. Disclosure: Once again, ChiIL Mama is elated to partner up with Fresh Thyme and thank them for providing a gift card for our giveaway. We have been paid to share the grand opening info with our readers. As always, all opinions are our own. Comments left on our blog about Fresh Thyme can be used on Fresh Thyme promotional materials. I'm looking forward to checking out their bulk food bins!